I’m convinced they are one of life’s best little luxuries. And every time I place them on my cutting board and give them a quick slice, or a rough chop, or maybe a fine chiffonade, I can’t help but lean down to inhale those magical fresh scents again and again. And then “oooh” and “ahhh” and insist that Barclay come take a whiff too. And then, inevitably, sprinkle an extra handful into the recipe, just for good measure. Fresh herbs are just the best. And this time of year, they are downright overflowing in the markets here around Barcelona. 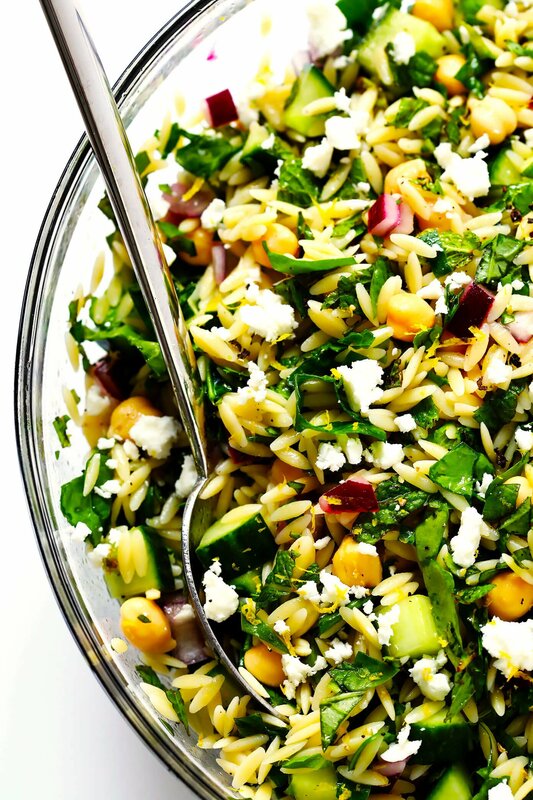 So this weekend, I decided to put a big crop of fresh basil and mint to use in a zippy lemony orzo salad. 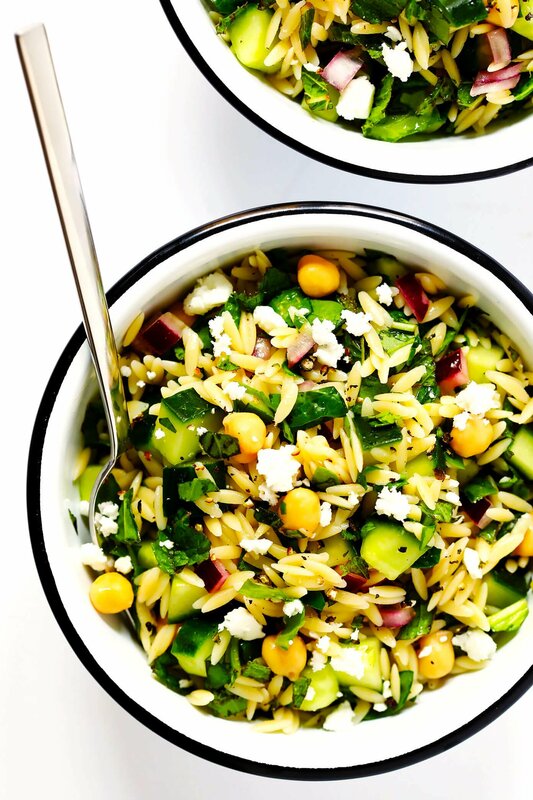 It’s filled with lots of fresh cucumber, red onion, chickpeas and spinach, and tossed with a simple dressing of lemon juice and olive oil, and sprinkled with a bit of feta or goat cheese (if you’d like). 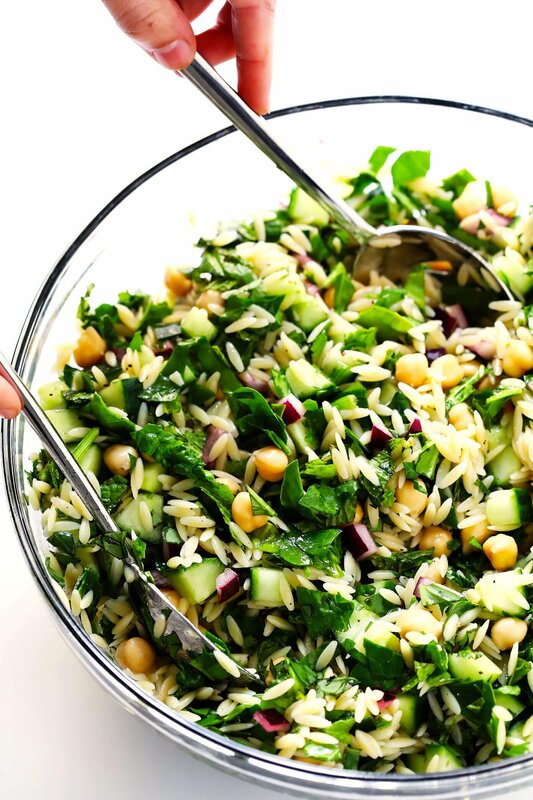 But all of those freshly-chopped herbs are undoubtedly what take this recipe over the top. Feel free to add in any of your faves (a bit of dill, thyme, parsley and/or rosemary would also be delicious here). And of course, feel free to sprinkle in an extra handful for good measure. 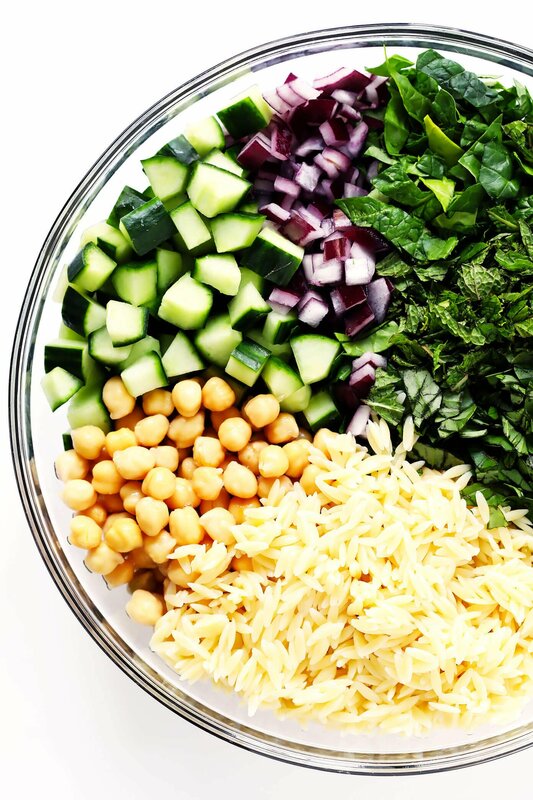 Here’s what I used to make this pasta salad. But please feel free to sub in your favorite ingredients in any of these categories! Also, I realized afterwards that some toasted pine nuts or almonds would be delicious in this salad, if you feel like tossing a few in. Prepare your pasta. Cook it al dente according to package instructions, being sure to generously salt your pasta water. Then drain and rinse with cold water until chilled. Toss all of your ingredients. Combine the pasta and the remaining ingredients in a large bowl, and toss until evenly combined. Taste and season. Don’t skip this step! ;) Give the pasta salad a taste, then season with a few pinches of salt and pepper and extra lemon juice (if needed) until the balances of everything tastes right to you. Serve! Then serve it up! 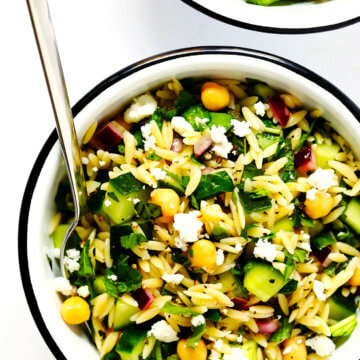 Or if you’re making this orzo salad in advance, cover and refrigerate it for up to 3 days until ready to use. Super simple. Super fresh. And super good. 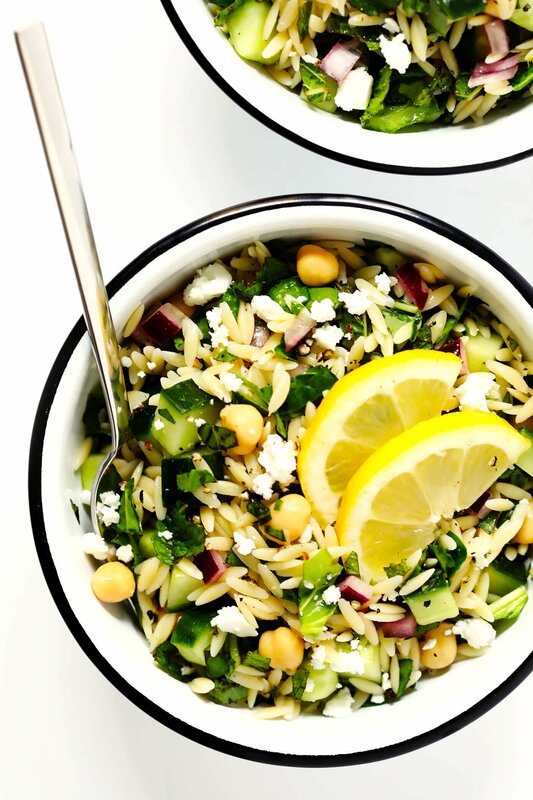 This Herb-Lovers Lemony Orzo Salad is full of fresh and zesty ingredients that everyone will love! Perfect for serving as a main dish or side, and easy to customize with your favorite add-ins. Cook the pasta in a large stockpot of generously-salted water until al dente, according to package instructions. Drain pasta then rinse thoroughly in a strainer with cold water until the pasta is chilled. Transfer pasta to a large mixing bowl.